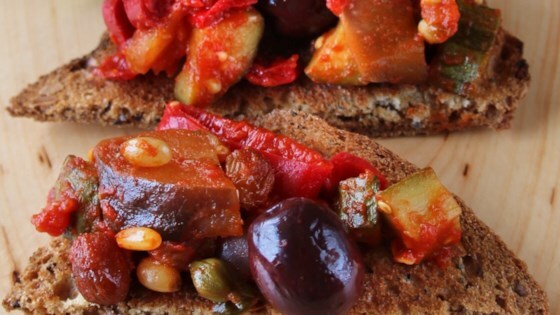 "Caponata is a Sicilian dish with eggplant, zucchini, tomato, and peppers traditionally cooked in oil and vinegar and flavored with sugar, raisins, capers, olives, and pine nuts. It's tangy, sweet, crunchy, and salty all at the same time. Serve at room temperature as a side dish to grilled fish or as a starter on toasted bread. Store leftovers in fridge and reheat gently. It will taste even better the next day!" Bring a large pot of lightly salted water to a boil. Add celery and cook uncovered until softened, about 1 minute. Drain in a colander and immediately immerse in ice water for several minutes to stop the cooking process. Drain. Heat oil in a large non-stick skillet over medium heat; add onion and celery and cook until soft and translucent, about 5 minutes. Add eggplant, red bell peppers, and zucchini and cook until slightly softened, about 5 minutes. Stir in tomato puree, vinegar, and sugar. Cook until the vegetables are tender, about 15 minutes. Add olives, raisins, pine nuts, and capers. Season with salt and pepper and cook until flavors are well combined, about 5 minutes. Remove skillet from heat; stir in chopped basil. Cool and serve at room temperature. Authentic, classic recipe. The first time I had this it was alongside burrata and it is an excellent combination. Toss leftovers with pasta or add them to risotto. Thank you for the recipe.